Oh dear! It has come to my attention that I have not posted anything in almost three weeks. Trust me I have been in a whirlwind of busyness but I really have missed this little blog. What have I been up to? Well, working mostly non-stop. I was at a food show last weekend in Anaheim and then this past week traveled to Minneapolis to present some items to food buyers. 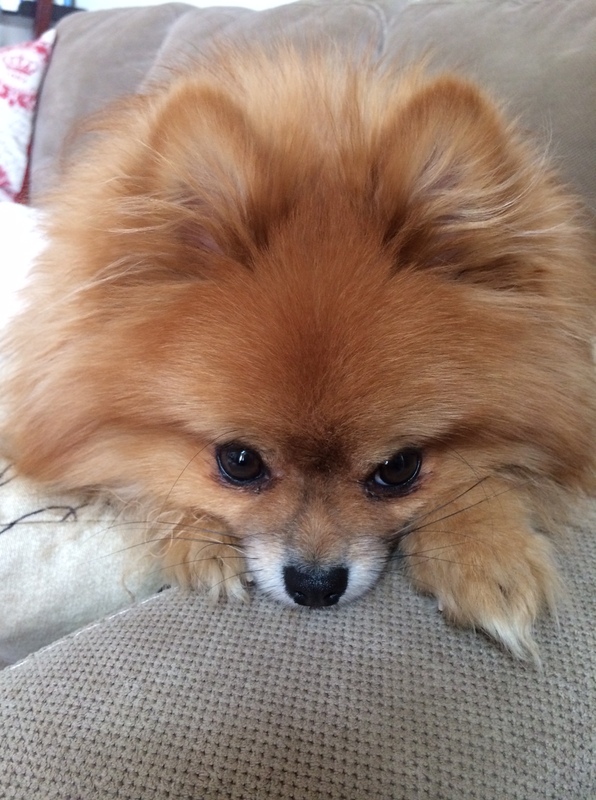 Not to mention my love, my best friend, and apple of my eye had a fluke accident and hurt his little back….badly enough that the vets were considering surgery. He was not able to walk and in an instant his precious life flashed before my eyes. What if he will never walk again? Is he paralyzed? What on earth happened to cause this? Turns out he is NOT paralyzed and an MRI showed that he has a few dislocated disks. I do not know what caused this and he was given thermal laser treatment and prescribed a steroid dose. Luckily, this little guy is a trooper and everyday he is getting stronger. He can walk almost normally again a week since the accident and now I am just waiting for him to fully recover. It is moments like this where you realize to never take anything for granted. In one instant there can be a fluke accident and a loved one can be taken from you. Just keep him in your thoughts sil-vous-plait! So that in a nutshell is my life at the moment. I love this site and really want it to always be a report on total positivity but that would not be reality. Life is full of happy joyous times as well as sad, overwhelming times. Truly, on a normal basis I wait to post until I have inspiration from somewhere whether it be travel, food, culture, a great restaurant or book but sometimes it is just good to vent about reality. Okay, onto this amazing biscotti that I just baked! I LOVE this recipe and have been using this base recipe for years and just changing out the flavors. Spring is definitely in the air…I can feel it and I was inspired to bake these. 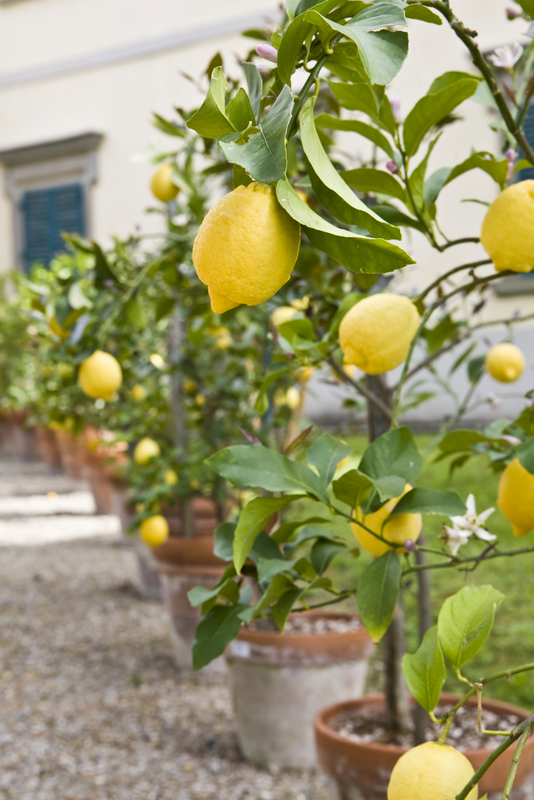 Oh and my lemon tree finally has lemons that are ready to be picked. So exciting! Bake these for a brunch, to enjoy with your afternoon tea, or as a dessert. 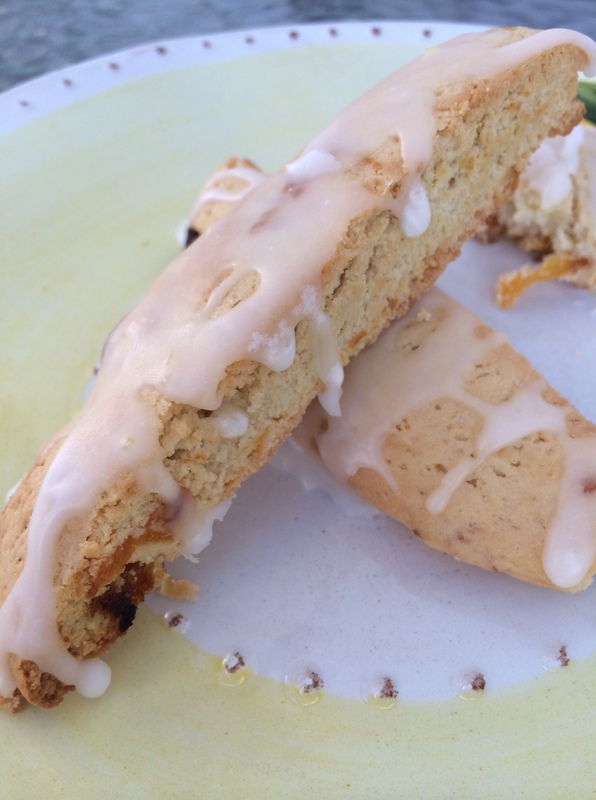 The lemon glaze makes these biscotti a total WOW! In a bowl, cream together butter and sugar. Add the eggs and vanilla extract. Beat well until smooth and creamy. In another bowl combine the flour, baking powder, and salt. Add this to the wet ingredients and beat until just blended. Fold in the apricots and lemon zest. Divide the dough in half, pat down into disks and wrap in plastic wrap. Refrigerate for 1 hour. On parchment paper, unwrap each disk. Flatten to a long rectangle about 2 inches wide. Bake for 20 minutes. Slice each rectangle into 1 inch strips, diagonally. Face each cookie cut side up and bake for 5 minutes. Flip the cookies to the other sideband bake for 5 more minutes, or until golden. These keep really well in the freezer for up to 4 months. Lemon glaze- combine lemon juice with powdered sugar. Add in a little melted butter until thick and smooth. Once cooled drizzle cookies with lemon glaze. Know that I am praying for sweet Simba!!! Such a precious little guy!!! Krista, I’m so glad Simba is better! We were all praying for healing! Your Biscotti looks amazing! Have fun with your sis and give everyone hugs from me! J’espère que petit Simba 🐶 va déjà mieux! Les biscottis sont une bonne idée: j’adore les citrons! Wonderful recipe Krista…what a treat for the ladies! I’m so happy that Simba is on his way to recovery. Your blog never fails to inspire….no matter what you write!